A few days ago Google pushed out a new and major algo update for local search .Google rolled out a new local search algorithm update to provide more accurate local search results to businesses. The update has significantly affected the search result pages for many local search queries in US. There is no internal name for this update however the name Pigeon was decided by the Search Engine Land team to refer it to local search updates as pigeons tend to fly home. The details of this update are available here. When the Google Panda update launched, there was no official name from Google, so we named it the “Farmer” update. A few days later, Google told us they internally named it the Panda update. So we switched names from Farmer to Panda to avoid that confusion. What has changed with this update? The Google Pigeon Update will impact local search results with rankings and local businesses likely to see an increase or decrease in website referrals, leads and search queries. The new algorithm is expected to improve the distance and location ranking parameters of the search results. It has currently rolled out in US English results and aims to provide a useful and relevant experience to users seeking local results. As of now, there is no evidence as to whether the update will be rolled out in other countries and languages. I’m worried about Australian businesses and whether we should re-look at our strategies and work on improving local listings. The core changes are behind the scenes, but it does impact local search results rankings and some local businesses may notice an increase or decrease in web site referrals, leads and business from the change. Google told us that the new local search algorithm ties deeper into their web search capabilities, including the hundreds of ranking signals they use in web search along with search features such as Knowledge Graph, spelling correction, synonyms and more. In addition, Google said that this new algorithm improves their distance and location ranking parameters. 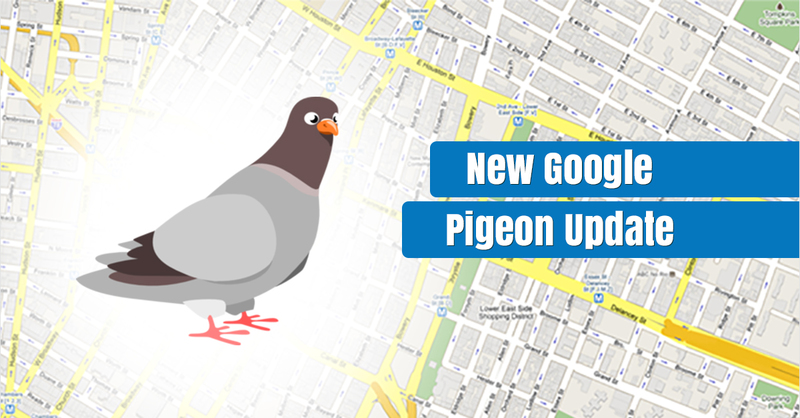 Overall, this Pigeon update is all linked to the local search results for your businesses or websites. This update has also tied local results more closely to standard web ranking signals. This will surely benefit the sites that have stronger SEO signals. So, to attain high ranking on local Google search results, it’s the time to change your SEO techniques as per Pigeon update.